BEIRUT -- Syrian rebels and their families began to leave a besieged town in the eastern Ghouta suburbs of Damascus on Thursday, BBC News reported, in an evacuation deal that will see the town handed over to the government following years of siege. Rebels released 13 prisoners of war ahead of the evacuation. The deal is the first such arrangement made for a town inside the beleaguered eastern Ghouta enclave, which has endured one month of relentless shelling and bombardment as the government, backed by its ally Russia, pushed to retake the area after seven years of revolt. The agreement could serve as a blueprint for other towns in the enclave. State-affiliated al-Ikhbariya TV cast the deal as a victory for the country. Its correspondent Rabieh Dibeh said 10 buses had crossed into the town of Harasta to transport the "terrorists" - as the government refers to all armed opposition fighters - to a rebel-held province in north Syria. The camera showed dozens more buses waiting to enter Harasta. Critics say it is a formula for displacement that lets the state choose its citizenry - and expel those opposed to or fearful of President Bashar Assad's authoritarian rule. Some 6,000 civilians are expected to depart with the militants, some of them family members of the rebels and others activists, and other people afraid of the government's vindictive security services. An unknown number of others have already been forced out of their homes or killed in the government's ferocious campaigns against Harasta and eastern Ghouta leading up to the deal. 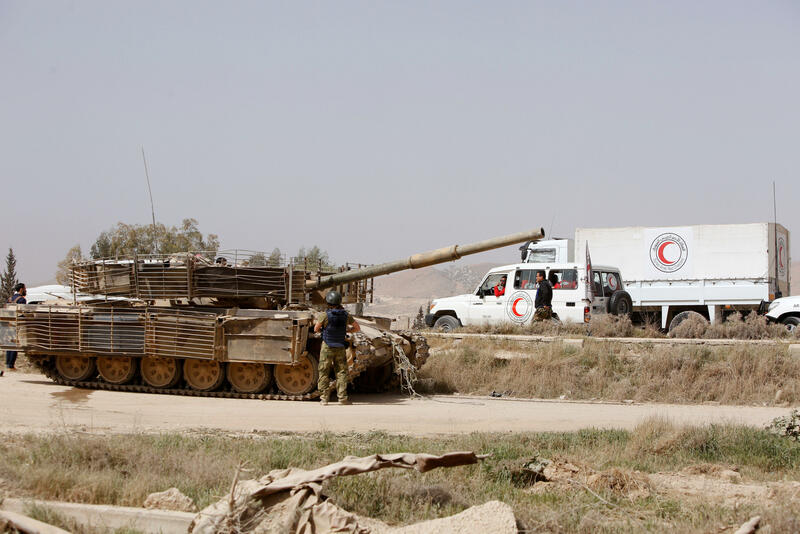 The United Nations and the International Committee of the Red Cross are not facilitating the evacuations; they are being done in conjunction with the Syrian Arab Red Crescent. Human rights groups fear Ghouta in Syria could become "another Aleppo"
Harasta appeared in ruins in a broadcast from al-Ikhbariya, and apartment blocks in the town looked gutted. Monther Fares, a spokesman for the rebel faction Ahrar al-Sham, confirmed that his group's fighters were preparing to depart. The government-controlled Military Media Center said 1,500 rebels and 6,000 civilians would leave Harasta on Thursday. The 13 men released by the Syrian rebels ahead of the evacuation identified themselves to the media as soldiers and civilians attached to the Syrian army, who were captured by rebels in the fighting for Harasta. In the TV footage, many cried in relief, thanking God, the Syrian army, and President Assad for their freedom. Al-Manar TV, which belongs to the Lebanese militant group Hezbollah, a key Assad ally, said the government released five "terrorists" to rebels, in exchange. Fares said the rebels agreed to leave because of "civilian pressure" resulting from intensive airstrikes and "warplanes that do not leave the sky," adding that residents of Harasta have spent the last three months inside shelters. Russia, a military backer of Assad, was the guarantor of the deal, he said. Also Thursday, civilians streamed out of another part of the eastern Ghouta, continuing a trend that has seen close to 50,000 people flee across lines to the government for safety. The Russian military said more than 1,000 civilians left rebel-held suburbs of the Syrian capital Damascus on Thursday morning. Maj. Gen. Vladimir Zolotukhin told Russian news agencies in Syria the civilians left through the Wafideen crossing. The Britain-based Syrian Observatory for Human Rights monitoring group said some 4,000 people departed the besieged town of Douma in the last 24 hours.